To drive demand creation and behavior change, we have to unlock the motivations and desires of our target audience and leverage them to frame the intervention. We aren’t selling HIV prevention, we’re selling control; we aren’t selling a vaccine, we’re selling hope; we aren’t selling breastfeeding, we’re selling a healthier future. This is how we create change. We investigate and distill universal human truths that allow us to design brands for global initiatives, build demand creation tools for public health, and develop creative campaigns for product launches. No matter the challenge, our solution is to play a meaningful role in people’s lives. 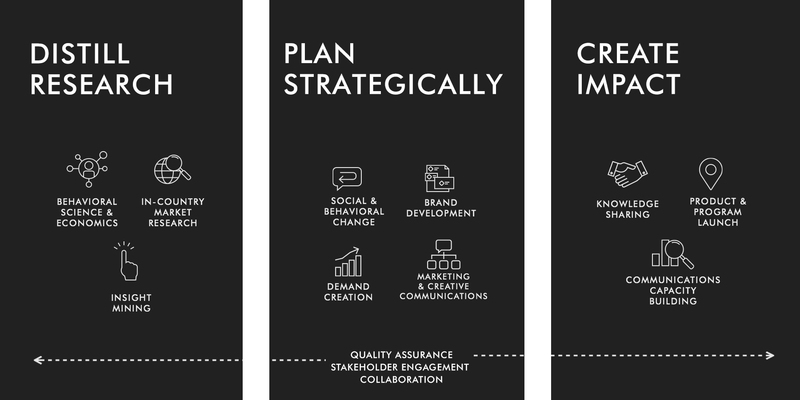 We use our proprietary strategic methodology, Truth 2 Meaning, and work collaboratively with in-country affiliates to develop people-centered solutions that drive awareness and uptake of health information, behaviors, services, and products. We build the capacity of individuals, communities, organizations, and nations to ensure the sustained impact of our work, whether it be creating behavior change communications to reduce harmful drinking or imagining creative campaigns to drive increased immunization rates at the last mile. Interested in learning more? View our case studies here.